Of course no one wants the market to crash, but the question we ask today specifically applies to those of you putting aside extra earnings each year. Phrased differently, do you want markets to go up or down? If we know that stocks will average some long-term return (let’s assume 7%), and we have a crash today, that means future returns will have to be slightly higher than average. Let’s look at some numbers. We’ll consider three different ways the market can give us 7% annualized returns over the next 20 years. First, in grey above, markets perform slightly above average for 19 years and then crash by 30% in the final year. Next, in blue, markets give us 7% each and every year. And finally, in orange, markets crash this year and then provide the same slightly above average return for the next 19 years that we had in the first scenario. If we are maximizing our 401(k) at $18,000 per year, we can easily calculate the end portfolio value after 20 years. From the table below, we see that a “Crash Now” provides an extra $350,000 to our portfolio than the “Crash Later” scenario. And the steady return scenario lies in between. Well, let’s think about this a different way: Does it make sense that a lower cost for your long-term portfolio will create higher long-term returns? 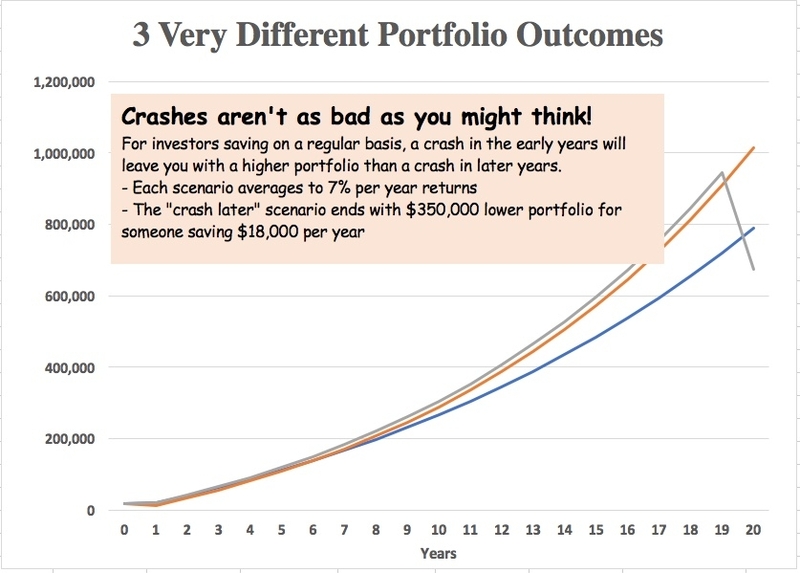 A lower cost to your portfolio is exactly what a market crash offers those who are saving annually! Here’s the catch: you must continue to invest right through the market crash, and you must stick with your beautifully diversified investment portfolio when all the world is telling you to sell! Sell! SELL! In short, you must have Faith in the Future, Patience, and Discipline.